had a problem: Her beloved vintage handbags stank of cannabis. Kavanagh’s love of vintage accessories is rivaled only by her love of an expertly rolled joint, and she realized she needed to find a way for the two passions to coexist without any lingering odors. She did some research and found the only bags she could store her stash in, that fit nicely into her handbags, were plastic, branded with stereotypical stoner logos. Kavanagh wanted something different—a bag that kept the stench of cannabis out of her handbags, while fitting nicely with her style sensibilities. 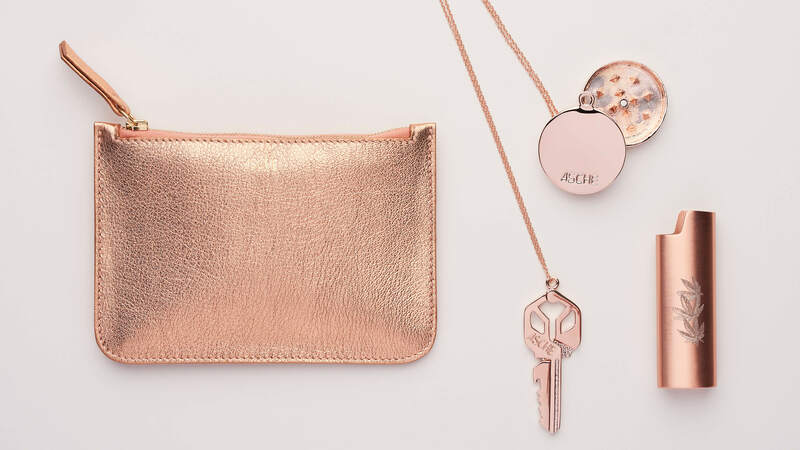 So she designed one herself, which eventually spawned Asche Industries, a brand focused on high-end, odor-proof leather accessories and stylish (but stealth) jewelry that moonlights as useful smoking accessories. Kavanagh worked for over a decade with Ford models and as a fit model for various companies, in addition to being a partner at Overbey & Dunn, the acclaimed West Village vintage and antique installation boutique and gallery, so her transition into accessories design was a natural one. She consulted with friends and colleagues in the industry to help with a prototype, and through trial and error, found fabrics and zippers that worked best together, as well as the best sewing techniques. The man who made her first prototype is the same man currently making all Asche Industries’ pouches. The intention was never really to start a huge company—or even a small one. Kavanagh just wanted to make bags for friends with the same joint problems, and word quickly made its way to more people, particularly women, who wanted them for their bags and their stash. But the bags weren’t enough. Kavanagh’s fashion savvy told her she needed a full collection of cannabis accessories to make this work. “I have a particular aesthetic, but I also was just a pretty frequent cannabis smoker; the group of friends I ran around with all had this fashion-forward sense, but the cannabis industry didn’t align with that,” Kavanagh says. In other words, the classic neon and tie-dye aesthetic that’s typically plastered all over head shops. She and her friends wanted updated accessories that matched the progress made in other parts of the cannabis industry, such as medical and recreational legalization. When considering other items to include in Asche’s line, Kavanagh drew inspiration from vintage jewelry. Her goal was to make vintage-inspired smoking accessories from the past, with improved function and look. Their key roach clip was a classic accessory during the 1970s that can now be purchased as a sleek necklace or keychain. Though Asche was one of the first companies to design updated, high-end cannabis accessories, they’re no longer in a category of their own. SoothSaye is a Portland, Oregon based company with a variety of minimalistic tamper necklaces and keychains. For those looking to up their smoking game, Wandering Bud, based in Kansas City, Missouri, designs porcelain smoking accessories that can be displayed as art, not solely used as pipes. The clean, discreet design for each of Asche Industries’ accessories is intentional, but is not based in shame. As Kavanagh puts it: “That is part of our brand, discretion. It’s not because I am ashamed; I just don’t want cannabis leaves all over my stuff. It doesn’t fit with my personal aesthetic.” Discretion also allows Asche to engage with customers who are curious about cannabis, or perhaps are just starting to dip a toe into the industry. While she doesn’t come up against the stigma of cannabis in New York or Los Angeles, Kavanagh encounters hints of it while in her hometown in Kansas. “Things are very undercover here. Not only am I a woman, but I’m a mother and a cannabis user. And the other mothers I go out with here, they want to have [cannabis] parties or secretly want to keep gummes in their purse.” Those women in pursuit of a marijuana-centric party will soon get a suitable shindig: In the next few months, Asche will co-host an event to introduce mothers from a prestigious school in Kansas to cannabis in a safe environment, where they can ease their way in. Incorporated into the event will be lingerie and other items women are curious about, but might not openly discuss. In keeping with her focus on curiosity, experience, and minimalism, Kavanagh has developed two sets of candles for Asche. The first is an indica and sativa foncé; neither candle incorporates cannabis, nor are they meant to have the fragrance of it. Instead, they will evoke the feeling one gets from an indica or sativa. The foncé set will be clad in all black, with the sativa being a vibrant and arousing winter citrus, while the indica is meant to be cozy and intimate, with notes of amber and cinnamon. The candles will take a new approach for spring and summer as part of the lumière collection. It’s been four years since Kavanagh set out to save her vintage bags without giving up her smoking rituals. Although motherhood means she may only have time for a quick hit from her vape pen these days, she still loves the ritual of joints, only now, they can be enjoyed with far better accessories.